Take your dart game to a whole new level with DART TAG darts. Designed to stick to DART TAG scoring vests and targets (each sold separately), these colorful foam darts let you blast away for hours as you challenge a friend or perfect your game as you play solo! 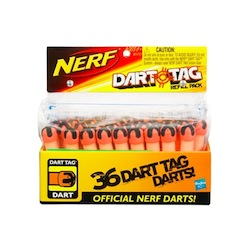 For best results, use genuine DART TAG darts with any of your DART TAG blasters each (sold separately). Includes 36 DART TAG darts. Ages 8 and up.